Yesterday was Independence Day in the U.S., but the Fourth of July is not one of my favorite holidays. For various reasons. But partly because the original Declaration of Independence, which was ratified on July 4, 1776, was the declaration of the independence (from British rule) primarily for white males in the Colonies. While the words “all men are created equal” in the Preamble were later greatly emphasized by the abolitionists, slaves were certainly not considered equal to their white owners in 1776. And while some might argue that “men” was a generic term, and not gender specific, women in fact were not given the right to vote until 144 years later! Thus, rather than celebrating July 4, I suggest that it would perhaps be more appropriate for the people of this country to celebrate July 9. Why? Because the Fourteenth Amendment to the U.S. Constitution was ratified on that day in 1868. Through the years we have all heard much about the First and the Fifth Amendments, and recently especially about the Second Amendment. 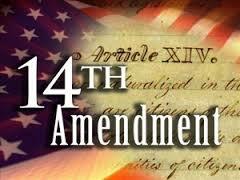 But for some reason many of us, at least I, have not heard as much about the Fourteenth Amendment. In fact, it was not until I was in Little Rock in January 2011 and saw words of the Fourteenth Amendment emblazoned on the wall of the Little Rock Central High School National Historic Site Visitor Center that I began to grasp the significance of that constitutional amendment. But that was hardly the reality for many people in the U.S. for long, long after July 4, 1776. The Fourteenth Amendment greatly contributed toward making those words ring true. But for decades after July 4, 1776, large numbers of people in the new nation were not free. But the Fourteenth Amendment helped to rectify that situation. Those are the words that led to the historic Brown v. Board of Education Supreme Court decision in May 1954 and, consequently, to the integration of Central High School in Little Rock (and other schools) in 1957. Ninety years earlier, in January 1867, Kansas became the ninth state to ratify the 14th Amendment, and Missouri did so just two weeks later. Then when South Carolina ratified it on July 9, 1868, that meant that 2/3 of the states had done so. The amendment, therefore, became a part of the Constitution. Yes, we USAmericans have, and will, celebrate the Fourth of July this week, as we should. But even though it is not a national holiday, let’s also celebrate the Ninth of July and commemorate the ratification of the highly significant Fourteenth Amendment. This entry was posted in Regular Post and tagged Fourteenth Amendment, Fourth of July. Bookmark the permalink.